Guest performances on stage at the Ōtaki Kite Festival have brought new opportunities for talented local singers Tui Tahere Katene (Ngāpuhi and Ngā Rauru) and James Kereama Stent (Raukawa ki te Tonga). 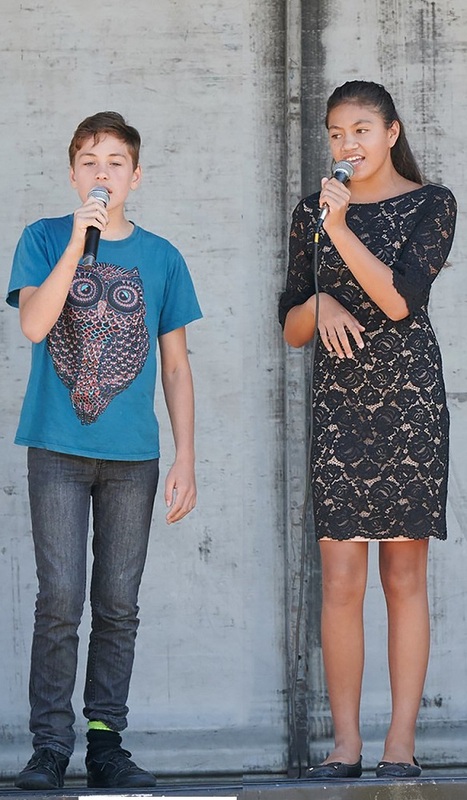 ON STAGE: James South and Tui Tahere Katene, both aged 12, on stage for Children’s Day at the Levin Adventure Park. Their individual live performances and subsequent online posts were enough for organisers of other big events to coming knocking at their door. On Sunday, March 24, they will be opening the NZ secondary schools volleyball national tournament at Central Energy Trust Arena in Palmerston North, after organisers contacted the kite festival team. The audience will be more than 500 people. Due to one of James’s Facebook posts from the kite festival getting thousands of views and seen by music industry professionals, he is headlining the dinner on Saturday, March 23, for the Levin Whānau Show. He will be singing hits from the 50s and 60s in front of more than 800 paying guests. The two have already performed at Children’s Day in Levin on March 3, they were a hit there, too. They even have a new song being written for them by Kāpiti author and songwriter Avril McDonald. It will be recorded and released later this year. It came about after Tui and James’s involvement in an international children’s book music project, Feel Brave. The kaupapa is all about teaching children how to “feel brave” and strong to get through emotional challenges (see feelbrave.com). The two singers starred in a recently released music video written by Avril for the Feel Brave project called Nothing Like a Good Friend. James and Tui were the lead vocals and the clip has been aired on the children’s television show What Now. The track is available internationally on YouTube, Spotify and iTunes. The entertainment co-ordinator at the Ōtaki Kite Festival, Graham Rikihana, says he heard them both sing before the festival so was keen to get them on the festival stage. Graham has been working with performers and teaching music for many years. “They have a great future,” he says. Both Tui and James are still only 12 years old, and they live in Ōtaki. They went to He Iti Nā Mōtai kohunga together when they were young. James is now at Kāpiti College in year 9, and Tui is in year 8 at Ōtaki School. They are performing in Ōtaki next Thursday (March 21) in the talent showcase at Ōtaki School’s kai festival. Original generation time 1.3188 seconds.